I am sure by now you have heard of a first look and understand the concept. But just in case you haven’t, I’ll give you a quick explanation! The first look is a special time set up for you and your soon-to-be spouse to see each other before the wedding day shenanigans begin. It occurs after you’re both dressed and ready and before formal portraits. This modern tradition allows formals of the bride and groom to be done before the ceremony instead of after. Now, many photographers prefer a first look. In fact, a lot of them require it. This is for good reason, as the first look does make the flow of the day go much smoother. But I feel there are pros and cons to be considered before making a decision whether or not to incorporate a first look into your wedding plans. As a wedding photographer who has shot a pretty equal number of both, I have seen the pros and cons of both play out and know how to counteract the negatives so that either option can be a workable and enjoyable experience. It really comes down to what is most important to you. It’s your day, and I firmly believe that your vendors should try to accommodate your wishes as best as possible on your wedding day! So here are some things to consider when making this decision! A list of pros and cons for having a first look. 1. Pro: A first look really does make the day flow better. Kicking things off with a first look makes the whole day go as smooth as the frosting on your wedding cake! 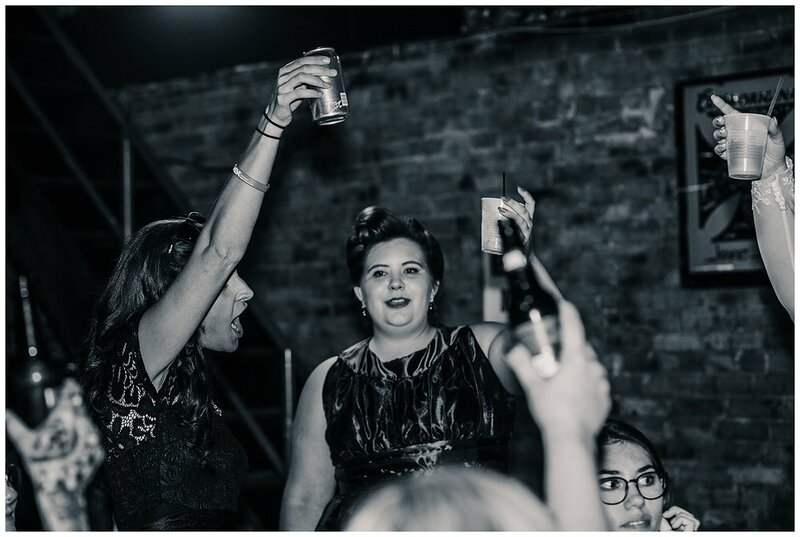 As a wedding photographer, I vow to make the portraits go as quickly and effortlessly as possible no matter what time of day. But even I know, a lot of people aren’t fans of having their pictures taken (*cough*groomsmen*cough*). Especially when they are just really excited for you and want to get to the party and start celebrating! Getting as many of the pictures as possible done before the ceremony even starts and with minimal distractions is such a great way to speed up the process and get this part out of the way early so everyone can relax and enjoy the rest of the day. 2. Con: The time of day is not ideal for outdoor portraits. Golden hour is no joke… it is the most beautiful light of the day and happens during the hour before sunset, while the most difficult lighting is around noon. Most often, a first look happens about 3-4 hours before the scheduled ceremony start time. Most ceremonies tend to happen between 3-5pm, which means portraits end up being (you guessed it) around noon. An experienced photographer is able to work with any light, but in all honesty, it is more of a challenge. I love to pull the bride and groom aside during that last 15 minutes of daylight to get some gorgeous, romantic golden hour shots whether you do a first look or not. Keep in mind too, depending on the time of year, outdoor portraits after the ceremony may not actually be possible (late Fall to early Spring the sun sets around 5:00pm). Now if your ceremony is earlier in the day, like 11:00 am or even 1:00/2:00pm, you may be better off keeping portraits after the ceremony so you have time for your hair and makeup appointments. 3. Pro: You’ll Look Your Best! Bride, you will look beautiful all day, I know that! But, imagine how amazing you’ll look right after hair and makeup! That’s when you’d be doing your pictures if you schedule a first look! Instead of after tears at the ceremony, the bottom of your white dress collecting dirt and dust, and wind-blown hair. The most important pictures are arguably the bride and groom and it’s so nice to look your absolute best for the portrait that will be blown up to the size of a movie poster and hung for all to see on that big wall in your living room. While most of us can agree that it’s really not “bad luck,” some bride’s still want that shock factor of her almost-husband seeing her in her wedding dress walking down the aisle. I totally get that! But here’s the thing... Your groom isn’t seeing the wedding dress. And he isn’t seeing the makeup and the hair. He’s seeing you. Everything he loves about you. The cute way you say that one word. The way your nose wrinkles when you laugh. How you always wait for him to watch your shows together. He’s seeing the years you’ve spent together and the future you’re going to build together. It doesn’t matter how many times he’s seen you before, it doesn’t matter if it’s been 5 days or 5 minutes, he’ll be seeing you for the first time in that moment and it will be just as special whether you’ve had a first look or not! How many of us have been to a wedding where you get to the reception, grab a drink, and wait… and wait, and wait and wait. They probably didn’t do a first look. It saves so much time! I love that with a first look you finish the ceremony, maybe take some family photos afterward, and then head to your reception. A cocktail hour is still nice to have so you can make a grand entrance, but you likely won’t need any longer than that! To make it work for not doing a first look, we just hurry through the photos as quickly as possible. But I’ll be honest, you won’t get near as many images because of the limited time, and they’ll most likely all have to be at the same location. 6. Con: Too emotional of a moment for introverts? Let’s face it, some people are just not very outwardly emotional.. There is this idea that the first look is supposed to be a big emotional moment and that it will be a disappointment if it isn’t. I wouldn’t want any of my couples to feel this pressure! So if you think one or both of you would not like a first look, it’s okay to skip it. Or if you think it’s cheesy, that’s fine too. But in my opinion, it’s just as wonderful to be happy and full of smiles than to shed tears of joy. It’s about you and your personalities, not any ideas of what “should” happen. I encourage couples to keep it true to you. 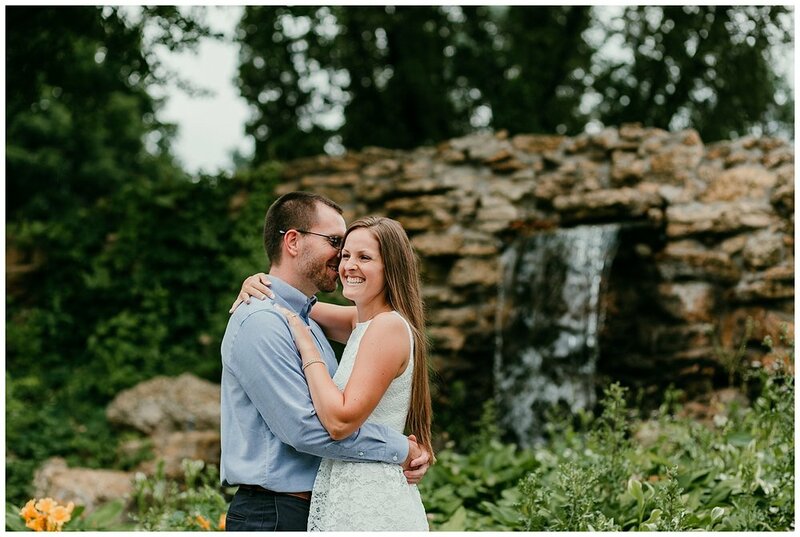 Not into a first look but still want portraits before the ceremony? That’s cool too. The point is, this is about YOU, nobody else. 7. Pro: Seeing each other early in the day will calm your nerves. As wonderful of a day as it is, it’s also kind of nerve-racking. 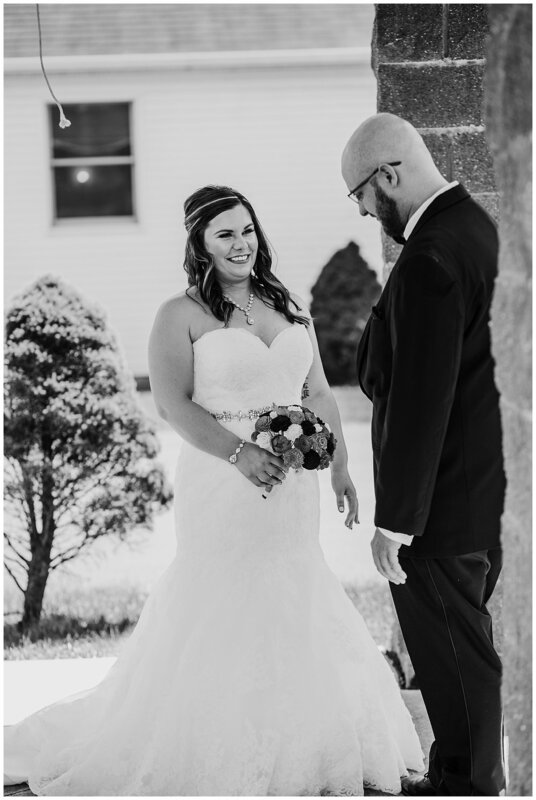 I was literally shaking down the aisle on my wedding day! That was ten years ago, before first looks were a thing. I’ve had so many couples tell me that as soon as they saw each other, hugged and chatted for a few minutes, they relaxed a ton. That’s your person, so of course he/she will make you feel better! Having a first look allows you spend more of your special day together and that makes it pretty great. I promise to use a long lens so I’m not up in your business during this intimate moment between the two of you. After getting a few shots to prove it happened, I like to step back and give you time to soak it all in. So now that you have some information and ideas on first looks, I’d love to hear your thoughts! Let me know in the comments if you are thinking yay or nay to doing a first look at your wedding! Already married? What did you do? If you could go back and redo your special day, would you change anything? If you’ve started planning your wedding, you may know by now that a lot of people have opinions about it. It gets to be a lot. But this is your time! Not anyone else’s. Well, except for your fiancé of course! There are so many wedding aspects out there that people may expect you to incorporate into your day. If you feel strongly about any of them, then absolutely go right ahead and you do you. But I’m going to share with you 6 common wedding traditions that I have seen many times that can totally be nixed to make your life easier. 1. You really don’t need a receiving line after the ceremony. Despite what you’ve heard or experienced at other weddings, a receiving line is completely unnecessary. In case you aren’t sure what it is, this is where you and your wedding party and parents all line up after the ceremony and greet each guest as they exit. It’s honestly a little awkward for your guests as they try to come up with what to say, and you’ll just hear “congratulations, beautiful dress” a hundred times. The receiving line also eats up a lot of portrait time and just moves the reception back later. You can totally skip this tradition and just catch up with your guests at the reception! 2. You don’t have to wait until the aisle to see each other for the first time. This is a hard one because it was a beloved tradition for a very long time. But the good news is, it’s no longer taboo to see each other before the ceremony. So many couples are opting to set up a first look earlier in the day in order to get wedding portraits done and out of the way. This allows you to get to your reception much faster after the ceremony and get the party started. Your guests will thank you! 3. Skip the aisle runner. Save your money and don’t bother with an aisle runner. They almost never look as nice as you imagine it to and they get all wrinkled, torn and crooked usually before the bride even makes an entrance. 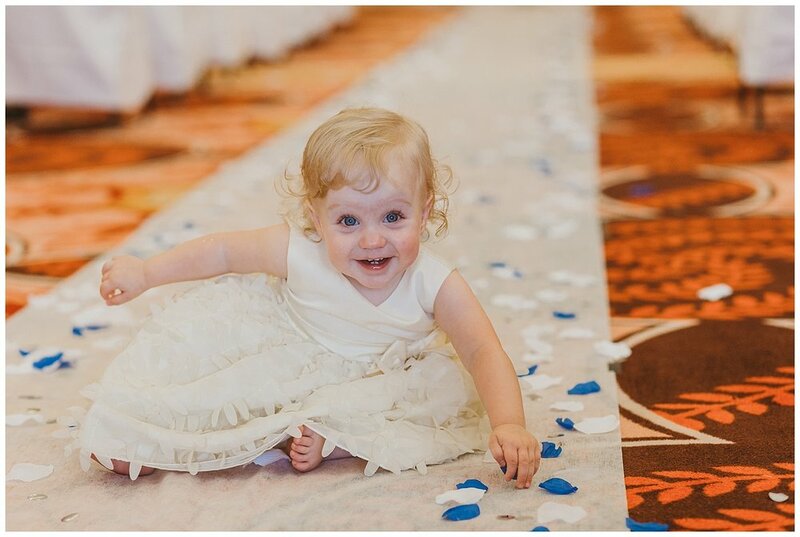 If you want an aisle runner, make it extra special and have it rolled out just before the flower girl walks down the aisle so it’s pretty and fresh for the beautiful bride! 4. You don’t have to choose between your friends. You have narrowed down your friends and selected the most special people in your life to stand up with you, and now feel pressured to put them in order of importance and choose a best man/maid of honor. Unless there’s an obvious choice, you really don’t have to choose between friends. Let there be two. Or only have bridesmaids so they can all work together to make you feel extra special. And my favorite suggestion…do some sort of friendly competition and let someone win the title! There is no point in making anyone feel less important than someone else simply for tradition’s sake. If you don’t want to choose, then don’t. 5. A Ceremony Exit Is Not a Must. While these can be fun and cool photo ops, a ceremony exit is sometimes kind of weird. This is because most of the time, you still have some portraits to take so you aren’t actually leaving. Here’s what happens. All of your guests stand outside with their rice or bubbles or whatever and wait for you to come out. You come out all excited, walk through the crowd, get to the end.. and then look around wondering what to do now. It’s pretty anti-climactic if you aren’t actually leaving. So unless you’re legit exiting the ceremony to hop in the limo and head somewhere else (an idea I love), maybe just forego a special exit. One of the biggest stressors couples seem to have is mapping out a seating chart. The solution, let people sit wherever they want. What you can do instead is place a “Reserved” sign on a few tables near the head table and let your immediate family know to sit there. Everyone else is perfectly capable of choosing a seat. Side note, if a seating chart is important to you and you choose to make one, don’t forget to include seats for your vendors! You may be wondering if you really need an engagement session before your wedding. Especially for my fellow introverts…you may be feeling a bit overwhelmed by all of this “center of attention” stuff. I HEAR YOU. Seriously, I understand the hesitation. But first of all, everything will be okay, and second, you have nothing to worry about. 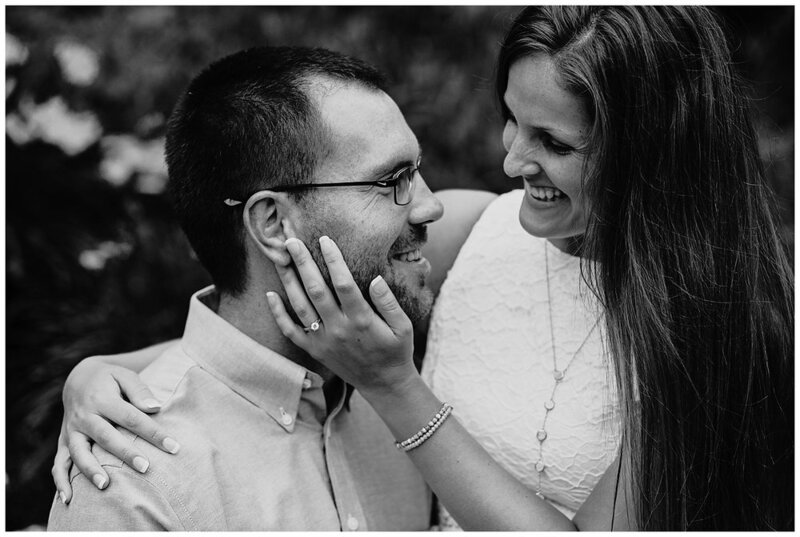 The engagement session is all about being relaxed, being yourself, and actually lessening the pressure. When was the last time you were photographed professionally? Unless you’re a working model, chances are, it’s been awhile. If ever. So instead of jumping right into a pro photo shoot during an already busy and ultra-emotional day, it’s key to have a practice run so you know exactly what to expect. You know you’re awesome. But your wedding photographer most likely doesn’t know much about you yet (just kidding, they know you’re awesome too). In all seriousness, it’s really important that they get a feel for how you are as a couple so they know how best to work with you. What prompts will get a reaction from you, if you respond well to jokes and silliness or have more of a soft, romantic vibe. These things are better figured out ahead of time than on your wedding day. Again, if you haven’t been photographed in awhile or ever, you’re going to feel a little awkward. Don’t worry, it’s completely normal. In fact, it would be super weird if you didn’t feel awkward for the first fifteen to twenty minutes. The beginning of your engagement session is exactly the right time to learn what to do, how to pose and how your photographer will be directing you. Trust me, it’s best to figure these things out at an engagement session with no extra people hanging around and no specific timeline looming. Save the Date Cards, Wedding Invitations, Guest Sign-in Books, Collages, Portraits to Display, an Engagement Album to share… just to name a few! They come in handy for the pre-wedding parties you’ll have - think engagement party and bridal shower. They’ll also be perfect for the sign-in and gift tables at your reception. And of course, just to hang up and display in your home to get you excited about wedding planning. This somewhat goes along with point 4, but it’s so awesome that it needs its own number. The wedding album after your big day is the number one best keepsake you’ll have. It’s an heirloom you’ll be able to share and pass down for future generations. What better way to start that sentimental album than with beautiful photos of you together as an engaged couple?! Your future grandchildren will love to see what you looked like together in “street” clothes, madly in love, in anticipation for the marriage ahead. 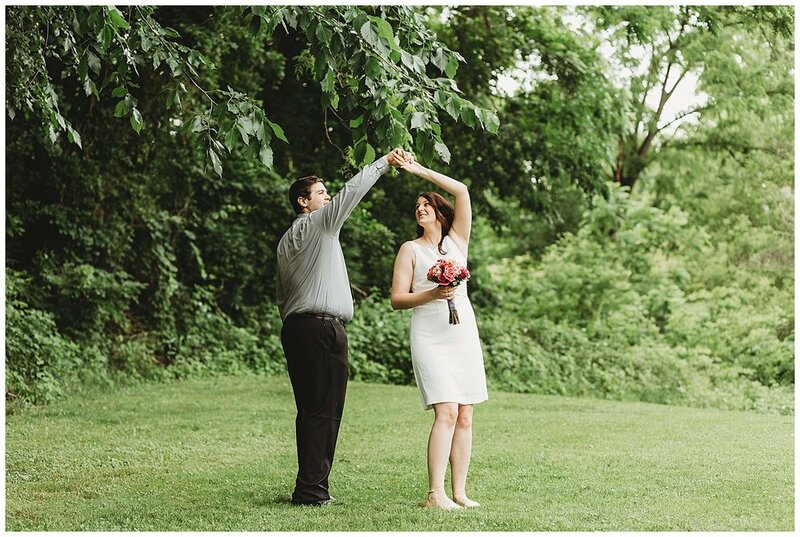 Side note, the beautiful couple in these photos was a dream to work with. Would you ever guess that they were “not picture people?” That’s what they got me prepared for, and then they killed their session! You don’t have to be outgoing and an experienced model, you don’t even have to like having your picture taken. You just have to be in love. You’ve got this.